This week at the library; or, ALA here I come as soon as I do 10 million things! We had a teen movie night last week where we showed the Hobbit and served pizza and 10 teens came! Well worth the $50 worth of pizza! And I'm very grateful our cataloger and one of my aides ran the evening so I did not have to stay. I did Tiny Tots on Monday evening for Pattie, which worked out well since our director was working Monday evening for me on the desk so I could work Tuesday evening on the desk for her. Also, we are up to 310 traditional summer reading participants and 32 teens. The teens have already surpassed last year's numbers. I can't compare the traditional program exactly to last year, b/c I have rubber ducky readers this year, but I had 344 ages 6-10 kids, so I am getting close. When I got home Monday night, I discovered my 1 year old computer had died. Of course, the warranty expired two days ago. Tuesday I arrived at work to discover the basement had flooded and the roof was leaking, but we did have over 100 people at Storywagon. I need to remember to have one of the aides help out with summer reading after storywagon. Every year I go to the pre-kindergarten classes at summer school. I was glad to go later this year, b/c doing it the first week of summer reading is crazy, even though it's a long day (8am to 6pm) and there is no a/c at the school. They claim that the teachers have to lug everything to the middle school b/c it has a/c, but not that I could feel. The kids were sweating and it was humid and hot. The only teacher with a moderately cool room had turned off all the lights! I was prejudiced against this book from the start. First, the cover is so...stereotypical. White kid forefront, fat kid and kid of color obviously the sidekicks. Of course the fat kid is eating, since that's what fat kids do. Then I flipped open the cover and read the author's note, basically saying that they wrote the book because there weren't any books "featuring modern, spirited boy heroes" etc. Now, this may or may not be true, depending on how you look at it, but I have found in the past that the minute you see the "there are no books like this so I had to write one" it spells danger. On the other hand, Chronicle is a pretty good publisher. So I read it. And you know what? It's not bad. Not as stunningly unique and wonderful as the publisher claims in their marketing, but not bad. 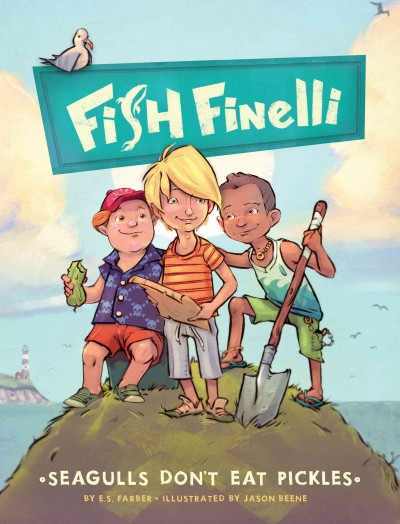 Fish Finelli and his friends are trying to get enough money together to build a boat engine and along the way they run into rich, privileged bullies, a mysterious recluse, buried treasure and a mysterious librarian. The book includes the average amount of artwork for a beginning chapter book and also has facts woven into the story and included in panels (this, btw, is not a new and daring idea - several other publishers, notably Capstone and Lerner, have been doing this for some time although the literary quality is not always high). It's a nice length - only about 150 pages and the overall adventure/mystery plot is fun. My main complaint about the book, and why I probably won't buy it, is that just like all the other "they don't write good adventure books for boys so I had to write one" books, there's a distinctly old-fashioned flavor to the story. Lots of stereotypical characters and the plot revolves around the kids being on their own, including sneaking out at night. I live in a small town and while I agree that there are kids out and about on their own all summer, they are not doing anything remotely like this. I could tell you what they are doing, but I've already washed the descriptions off the walls...they wander around, get drinks at the gas station, hang out at the library, and basically...do nothing. 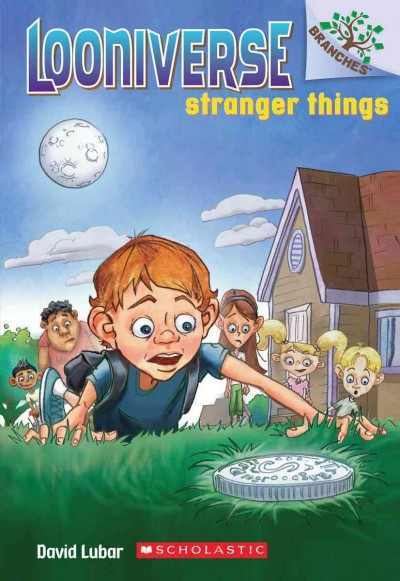 The kids who would read this book are programmed every second of the day into after school and summer activities and would never be allowed to go off for the whole day on their own without adult supervision. 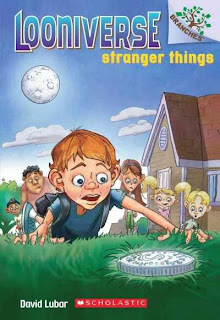 Of course, there's suspension of belief and the whole mystery/buried treasure plot is obviously a fantasy, but the book's intent of portraying the kids as realistic and then throwing them into a 1950s kids mystery just doesn't work for me. Verdict: I'll think about this one some more, but I'm probably going to pass on it. Most boys ages 8-12 like more exciting adventure stories, fantasy, and straight nonfiction. I already have several fiction/nonfiction blend series (Doyle and Fossey, CSI Club, Can You Survive...?) and don't feel like I need any more right now. There was a fairly large marketing push for this book and I received a review copy, so I will join the masses and add my opinion. One day, a little pink pig shows up on a rock in the frogs' pond. To their bewildered dismay, all he says is "Ribbit!" Other animals join the discussion and soon arguments and fights are breaking out. With a little help from a wise beetle, the animals realize that all the little pig wants is some new friends and they all join together in the trees at the end with a chorus of tweets. The art has a soft but textured look. You can see recycled words and images in the background of the pictures. There are little details if you look close enough - silly faces on the frogs, a wink from the pig and bristling feathers on the parrot. 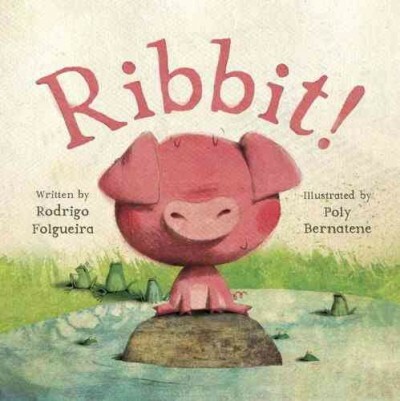 It's a fun story and the repeated refrain of "Ribbit" adds an interactive dimension, but I don't think it's as amazing as most of the reviews seem to think it is. By which I mean - it's a cute story to read aloud, but I don't see any four year olds going away and thinking "hey, I shouldn't make assumptions about new/different people." Most of them don't even really get the point - they just see a pig making frog sounds and think "funny!" Or, in the case of the class of four year olds I tried this out on, "Awkward!" Which just goes to show why I shouldn't read press releases, because even if I like the book, I generally don't agree with the marketing. Verdict: It's fun! It's cute! The pig says "Ribbit!" You can tell your educationally-conscious parents that it teaches vital social skills (even if you don't think it does). It is a little long for a storytime for under 4, but the kids at 4k I read it to liked it well enough that I am adding it to my annual frog outreach storytimes. I recommend buying it and enjoying the funny, cute story. Orca is starting a new nonfiction series for young readers focusing on environmental impact. 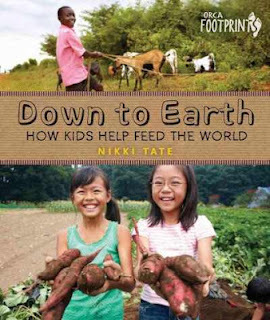 From the title, I was expecting stories about kids around the world who help feed their families. The book is really an introduction to food production on small, organic farms and in rural, undeveloped countries. At least that's the best description I can come up with. There are lots of photographs of kids helping on family farms around the world and many anecdotes from the author's own family-run farm, Dark Creek Farm. The book has a chapter explaining seeds, plants and gardens, a chapter on chickens and ducks, a chapter devoted to other animals like pigs and sheep and a final chapter on working animals, or multipurpose animals. The book is very balanced in its approach; for example, it talks about large-scale poultry farms and their drawbacks, but it also explains what other egg carton labels mean and that "organic" or "free range" don't necessarily mean the chickens are treated well or aren't affected by chemicals in some way. The book also talks about 4-H, genetic diversity in plants and animals, and how cows affect the environment. There are lots of suggestions for how kids can be part of the food process whether they live in a rural or urban area. There is a short list of further reading, websites, and an author's note about her farm and the people who helped her with the book. There is also a detailed index. I thought the economics aspect of the farms was a little weak; I live in a rural area and two of my colleagues have farms, most of my colleagues have gardens and there are lots of small farms and farmer's markets around here. However, only a few of them are self-sustaining - most of the farmers I know have to work multiple outside jobs to make ends meet. Of course, that's not really in the scope of the book, I just thought it was a little on the rosy side when talking about how much work goes into being self-sustaining. Verdict: Whether your population is urban or rural, this is a good resource to teach kids where their food comes from and get them involved in the process. I have high hopes of forming some kind of junior gardeners or children's garden program at some point in the future and have been collecting books on this subject in pursuit of that goal, so this definitely fits into our collection. It's briskly written and has lots of interesting facts. Recommended. Monday: Two-hour staff meeting, general Monday craziness. Tuesday: Phew, Angry Birds is over! I can relax, as much as summer ever relaxes. Very small groups at toddler storytime this morning - last year the attendance was MASSIVE, this year not so much. Who knows why? Also had a surprise visit from a daycare/after school care bringing kids in to check out books. On the one hand, it would be nice to know ahead of time that 20 kids are going to show up, especially when parents come to meet the group and they're not there and I have no idea what they're talking about. On the other hand, they're the most well-behaved group you could want and in fact gave one of my aides a real shock when she stopped to say hi to a kid coming out from the stacks...who was suddenly followed by 20 other kids, all of whom had been curled up on the bean bags, reading! Wednesday was exhausting - two lengthy storytimes followed by a number of difficult patrons. Thursday was frantic, but Messy Art Club was actually quite peaceful. Friday was adorable - click on the link above to see not only pics but some little movies of the kids dancing like various jungle animals. Saturday: Busy, but not insanely so. Week over! Benji has always been small and sickly. He also has a tendency to faint when he gets scared or overexcited. He's pretty much accepted his life as a loner until one day in fourth grade he's watching the school bully pick on a new kid and trying to figure out how he's going to get away without being seen when he faints...and wakes up in the hospital. Again. The doctor gives him two options - safety helmet or therapy dog. Despite his impassioned protests, his mom decides it's the helmet until, just as Benji predicted, it turns out to be a disaster. Only a few weeks later his therapy dog arrives. He turns out to be a giant, black Newfoundland. Who talks. Parker Elvis Pembroke IV informs Benji that he is really the president's new dog, but he agrees to stick around for a while until things get sorted out. At first they don't get along at all; Elvis is very prickly and a show-off and Benji doesn't think he needs anything to make him stick out anymore - like a giant talking dog that only he can hear - but eventually the two become close friends. By the time Elvis heads off to the White House, Benji has the first real friends he's ever had and a new outlook on life. I did laugh quite a bit reading this and enjoyed it, but I don't think I'll buy it for the library. For a book about fourth graders (which means the audience will be mostly third grade) 300 pages is way, way too long. Even for fourth-fifth grade that's long. The author is apparently a writer for a popular Disney kids show and there's a definite cinematic feel to the story, but what works on the tv screen doesn't necessarily work in print. There are a lot of inner monologues which I found funny as an adult reader but I think most children would get bogged down in them. There's also a lot going on - a popular girl athlete who wants to be able to do girly things and not devote her whole life to sports, childhood illness, bullies, a stereotypical nerd, etc. The plot device of the talking dog felt very immature and while it fits with the character of Benji, I don't think it would go over well with readers. Finally, one thing struck me as very out of sync. Even after the doctor explains what Benji's illness is (idiopathic epilepsy) he continues to call it "fainting" throughout the book. Of course every child is different, but every kid I've met with any kind of disability or illness has always been very specific in saying what their condition is - I think it's recommended to parents as a way for kids to take some control of their illness maybe, but I don't remember where I saw that. Verdict: Final conclusion - the bones of a good and very funny story are here, but it could have done with a lot more editing and a better idea of who the audience is in my opinion. Actually, you could have just removed the entire talking dog and White House aspect of the story and it would have been better (and shorter). I will make a confession: I am not a fan of Laurie Keller. I just don't get her art style and I've never been a fan of her brand of humor. However, I know that kids love, love, love Arnie the Doughnut and her other books. I even had a parent the other day tell me how much she loved the movie "I didn't know there was a book!" Um, yeah, there is. So, despite my personal feelings, when I saw that Arnie was moving into chapter-dom, I picked up a galley to preview. After his many adventures, Arnie is settling down to belonging to Mr. Bing and being his doughnut-dog. One of Mr. Bing's favorite things to do is go bowling and naturally, Arnie goes along. There's always plenty going on at the bowling alley, but it's especially intense when there's a competition going on. Will Mr. Bing, with the help of Arnie's magic sprinkles, win the day? Or will he be sabotaged by a mysterious ill-wisher? Can Arnie find out what's going on? The art in this galley is black and white, but I'm not sure if the final edition will be color or not. Honestly, it doesn't really matter. Although it's not to my personal taste, I can perfectly see why kids love Keller and this chapter book will pick up many more fans for this wacky author. Small chunks of text are interspersed with illustrations, speech bubbles, panels, and text in odd fonts and layouts. You'd think that a bowling tournament would be pretty boring, but Keller's silly humor and Arnie's unintentional funnies - like expecting all inanimate objects to talk back to him - make it laugh-out-loud funny. Verdict: Whether you have Arnie fans or not, quite a few kids will find this easy chapter book a hoot and will be glad to recommend it to their friends and wait eagerly for the sequels. Recommended. Confession: Sometimes I read books in storytime without previewing them. I'll do a quick flip to make sure there's not too much text, and then off we go. Pretty much everyone will tell you this is a bad idea, but it's always worked fine for me. 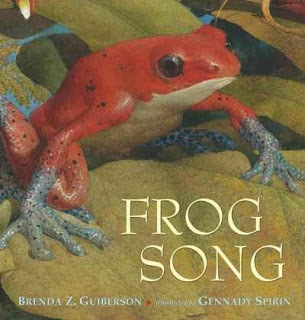 That's just to say that when I was doing a frog-themed outreach visit back in May, I scooped up a variety of frog books including Frog Song which I'd just received from Junior Library Guild, and pulled it out to read for the first time to a group of four year olds. I had expected that I'd need to skip pages, but to my surprise they were spellbound and we read the entire thing through from beginning to end. The book opens with a brief paragraph celebrating frog sounds and their love of water and then moves on to describe a series of frogs from the Scarlet-sided pobblebonk of Australia to the Darwin's frog of Chile. Each frog is distinguished by a particular feature of their life cycle or behavior and each description includes a delightful variety of frog sounds. If you are reading this book aloud be prepared to make chirp, brackbrack, buzzzz, and mwaa as you work your way through the frogs. There are sounds for laying eggs and rain, splashing into ponds, and more as well. While my personal preference for illustrations in nonfiction is photographs, Spirin's rich illustrative style fits well with the lush colors and details of the frogs and their habitats. The pictures are always beautiful, but in some places the setting and backgrounds aren't entirely clear as the atmosphere seems to have overtaken the realism. This didn't seem to bother the kids, who were mostly indifferent to the aesthetics of the art anyways and were more interesting in discussing whether the frogs were farting or pooping (the picture in question is actually of a midwife toad carrying eggs). There is a section on "frogs of the world" with a cameo of each frog from the illustrations and more facts about each one including their geographic range, length, and a quick fact. There is also a final author's note about the plight of frogs and a bibliography. Verdict: This is a great addition to nonfiction that can be used in storytime. For kids younger than four, it's easy to pick only a few of the frogs to read about and older kids will enjoy poring over the illustrations to find more details and reading the additional backmatter. Highly recommended. Summer is in full swing. I still have empty program slots in July, I haven't even looked at the ALA conference schedule, and none of my storytime plans are finished, but we're having fun anyways! In addition to the programs list above, Pattie also started back her storytime list (Tiny Tots, 2 sessions of Toddlers 'n' Books, Books 'n' Babies) and I also attended a 3 hour supervisor workshop on Thursday. My director misplaced a stack of bills which reminded me...I lost a receipt! Where is it! Panic ensues! Resignation sets in. I must grovel and fill out forms and try to remember everything I bought...swimming pools...cupcake mix....sigh. I must have underestimated from last year - we are already running out of bookmarks and we have had to print way more super reading club sheets than I had anticipated. On the other hand, almost nobody came to Preschool Interactive. I am trying to imagine a library with no preschool storytime. A decent number - about 8 - dropped in to play Wii. It was set up for four hours, so that's about 2 kids an hour and approximately 20 trips up and down the stairs to keep an eye on the room. 65 people showed up to Lego Club, which is about what I expect for summer. It always feels like more because they tend to stay longer than during the school year. Lots of new families, which is exciting. In the first step towards my Neighborhoods Manifesto, I have received permission to add series information to our juvenile fiction call #. Yay! Great crowd for boats - I have decided to make my summer we explores all drop-ins, similar to messy art club. Also had several groups from summer school drop by to pick out books in their *choke* lexile levels. Some we knew were coming, some were a surprise, but they were all well-behaved and at least they're reading! I am generally not a fan of pirates. I don't like pirate books for the same reason I don't read medieval romances; I simply can't suspend my disbelief. While everyone else is swooning over the romance, I'm thinking "OMG NO PLUMBING". I've read several histories of pirates and privateers and several books about modern-day pirates and a subject less-suited to a cute kids' book I cannot imagine. However! Sometimes it really does work well and I have to put aside my prejudices. North-South is one of my favorite small publishers and this is a little gem of a book with a delightful translation. Four pirates are excited to get an invitation to Polly's birthday party - but Pete the Parrot says they can't go until they take a bath, get some smart clothes, choose a suitable present (girls have to have cute dollies) and wrap it. Finally, they get to the party, only to be greeted by an infuriated Polly who invited pirates, not these strangers! and was hoping for a good present, not a stupid doll! Shortly afterward, Pete the Parrot is tied to the mast, the pirates are back in their comfortable clothes, and their original presents of a saber, cannon, rope, and a wooden leg are joyfully accepted. "It was a wonderful birthday party after all...and they had tons and tons of cake." The illustrations are delightfully detailed with lots of humor and sly jokes. Most of them are presented as small cameos within the page, each illustrating the text below. 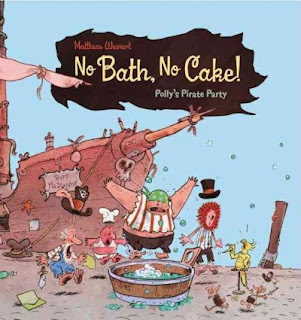 The pirates' outrage as Pete forces them to bathe "No bath, no cake!" dress up, "No smarty, no party!" and purchase a suitable present is hilarious. I read this to several 4k classes to test it out and I will admit that it's not an ideal read-aloud book for a large group. They did enjoy it - especially the scenes with the pirates in their underwear - but the pictures are really too detailed for group reading and would work best one-on-one. There were also gasps of horror at the use of the word "stupid" although the kids had no problem yelling "they're all fat!" when the pirates came out full of cake. Verdict: While not the perfect storytime book, this is the perfect book for a silly read-aloud one-on-one or with a very small group that can get up close and see the details. Older children who can pick up on the humor will especially enjoy this title. I do occasionally buy titles that aren't storytime material and this one is definitely going on my order list. Twinky is tired of being treated like a toy dog. He wants to be a big dog and do big dog things. But can he convince the big dogs that he's not a dinky dog? The basic plot is not a new one - there are plenty of books about little fancy dogs wanting to be treated like big dogs - but the mischievous rhymes and delightful illustrations make this a stand-out treatment of the classic plot. The rhymes are interspersed among the normal easy reader text as Twinky goes from being a big dog only in his own head to being accepted by the other big dogs and finally by his owner. There's also a nice and very subtle lesson; although the other dogs initially laugh at them, they also welcome him and teach him big-dog rules once he explains what he wants. In other words, the other dogs judge him by his actions, not by his size. Fleming's illustrations are a nice fit for the story with lots of blocky and colorful shapes. 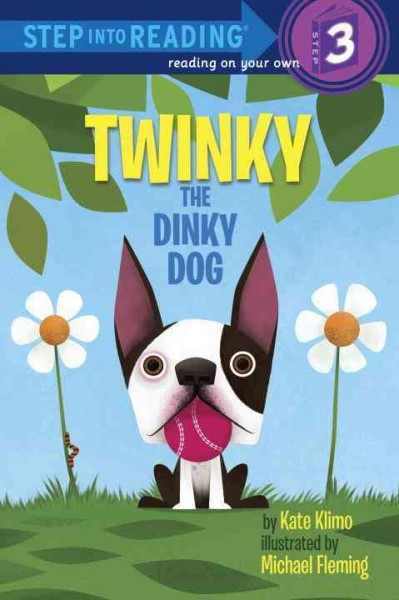 Although the art is simple, there's enough detail included, especially in Twinky's face and ears, to illustrate the emotions he's going through. They're also super cute! Verdict: This is a fun new easy reader that will make a great addition to any easy reader collection. Kids who like funny stories and dogs will pick this one up and I'd also suggest it to parents looking for titles to gently teach kids about not judging by appearances and welcoming kids who are different. This week I'm looking at rabbits, but with less success than my examination of squirrels. It's really, really hard to find good books on wild rabbits. The first title is in a series entitled How do we live together? 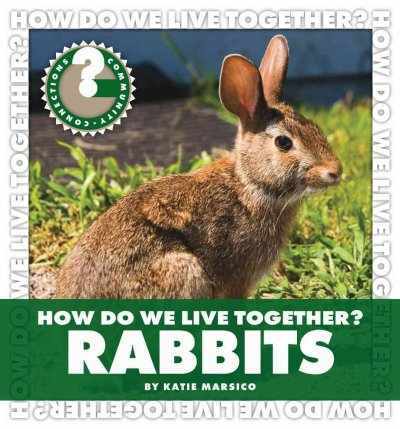 This is a very simplistic title that mainly focuses on how people coexist with rabbits. One of the photographs looked a lot like a hare to me, but I could be wrong. Another shows an adorably cute little bunny sitting in a live animal trap and the caption reads "Traps are not a very nice way to get rid of rabbits." There are a few suggestions on how to keep rabbits out of gardens and then the book ends by saying "It is our job to find ways to live with rabbits. Then we can all enjoy spending time together outdoors." 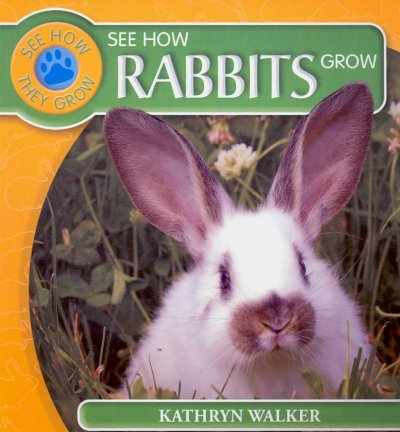 The audience for this book is unlikely to care that rabbits eat crops and the solutions are only going to work for a small garden anyways. This series seems kind of pointless. Next, we're back to the Backyard Wildlife easy reader series. This one is ok, but still too simplistic for what I'm looking for. 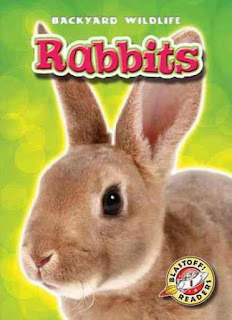 Also, the rabbit pictured on the cover looks like a Rex or Satin domesticated rabbit, not a wild rabbit. Pass on this one as well - it's not worth $20 of my budget. The last book I found is from a series called See How They Grow and while it contains the most comprehensive information on rabbits' life cycle and habits, it's mostly geared towards pet owners with sections on domestic rabbits, how to choose a pet, and how to take care of pet rabbits. I already have quite a few books on pet rabbits and don't need any more. Verdict: This was an unsuccessful review. No other libraries had any current titles on wild rabbits for me to borrow, so I'm going to have to buy blind and hope I get something good. Monday - I visited the 6th grade at the middle school, presentations at 8am, 9am, 10am, and noon. This is why I'm not a teacher; I could never get up that early every day! I feel that 7am is the ideal time to arise. I got to the school around 7:30, just in time for a fire alarm drill. The first group is always a bit meh (I'm not the only person who doesn't like being up that early), the 9am group is 100 kids and I only have 20 minutes, the last two groups are more awake and alert. Some of the teachers said they'd like to come to the library next year and I am all for anything that A. does not involve me trucking 3 milk crates of books on my dolly all over the place and B. has the kids checking out books. Then we had a staff meeting, paperwork and training for my new aide, etc. Happily, my director had volunteered to take my Monday evening at the desk, so me and my tired feet got to go home at 5. Tuesday - Westside school visit, last away-from-the-library visit! Lots of very, very enthusiastic readers - the 1st graders wanted to cheer wildly after every book that I showed and the kindergarteners were so excited they simply couldn't sit still! On the down side, apparently fifths disease is running through the school. I picked that up from the daycare kids last year and it was MISERABLE (yes, I know adults aren't supposed to get it). I will now bathe myself in disinfectant. Wednesday - 80 5th graders from Jackson came for a tour, scavenger hunt, and booktalking, plus a lecture on "How Not to Get Kicked Out of the Library When You Are Sixth Graders" My director ran the tour and scavenger hunt, and I did the talking. We split them in half and then switched. I do need to remember to split the candy in half - we mysteriously ran out for the second group. Otherwise it went really well. School visits DONE! Thursday - all sorts of misc. last minute things and 3 hours on the desk, during which I worked on my never-ending series project. Friday - last minute run to walmart, found swimming pools, YAY. Finished preparing for summer reading, processed all my new books, filled all the displays, cleaned out the Storyroom. Saturday - Summer reading begins! I borrowed a staff member to supervise the Welty Environmental Center program in the community room (they did Wiggly Worms and it was great - about 60 people) and I did "sign-up" i.e. hand out materials and explain programs in the lobby with Anna, our adult svs librarian doing the adults (and covering for me when I had to go somewhere, which happened frequently b/c Parks and Rec booked someone over us in the Community Room) It's so much easier now that we only count participation, not registration. Makes things a lot faster. I went through Super Reader Club forms really fast, but not many Rubber Ducky Readers (they'll sign up at storytime next week). Click here for a photo album of the Welty Center program. If you live in Wisconsin or Illinois, within driving distance of Beloit, I strongly recommend their programs! HA remembered what I forgot that I wanted to remember - have a laptop available for people to sign up for programs, the information desk got too busy. This Branches title is easier than several of the others and reads almost like an easy reader, not a chapter book. Boris lives in a bus. Once upon a time, his parents traveled the world in their bus. But then he came along and the bus was parked for good. He's never been outside Hogg Bay. Boris dreams of adventure and one day...the bus is on the move! Boris is hoping they end up in Africa, but it turns out they're just going to the Greater Hogg Bay Conservation Park. But it turns out there's adventure everywhere - not to mention new friends. The bright, cheerful colors of the illustrations make this simple story really pop and there's plenty of jokes and humor to keep kids interested. Again, this isn't a stand-out, must-have series but if you have an unending need for beginning chapter books, this will do well for the younger readers. Verdict: There are a lot of simple elements in this story, but they all come together neatly to make a story that kids will enjoy and parents will approve. I'd put this in easy readers for the kids who aren't quite ready for chapter books yet. ISBN: 9780545484428; Published May 2013 by Scholastic; ARC provided by publisher at ALA Midwinter 2013; Purchased for the library. Now we're moving over to the "boy-themed" side of the Branches series. It's hard to call it anything else when the two series featuring girls are all about fashion and bffs and the series featuring boys are about Things Happening. However. Popular author David Lubar takes on this series and we meet Ed, a boring, normal kid. But when he finds a mysterious coin...he's still a boring, normal kid. It's everyone else around him who's gone loony! Flying kids, super-strength, and all sorts of weird things happen. Will Ed get rid of the coin and all the strangeness in the world? Will his friends ever want to be around him again? Or will they realize that even boring, normal Ed has something a little...loony about him? Lubar seems to have two speeds, wacky-funny and creepy-funny. This falls into the wacky-funny camp. I will admit that I didn't think much of it the first time I read it through, but looking at it again I think a lot of that was due to the illustrations, which aren't very good. They seem to be going for a cartoonish look, but just fall into the amateurish range with the slightly distorted faces and big eyes. Not as many beginning chapter readers go for the wacky-funny as most people seem to think, but Lubar is a pretty strong author and I have lots of fans of his Weenie series. Verdict: I think this one is worth trying, especially if Scholastic eventually picks a better illustrator or the illustrations actually look better in the finished book, which is entirely possible. Welcome to Nonfiction Monday! Please leave your posts in the comments and I will arrange them in exquisite order throughout the day. 100s: Ghosts, aliens, sasquatches and other things that aren't real...or ARE THEY? 500s: Science, Math, and Wiiiild Animals! Ami at A Mom's Spare Time has How do Hot Air Balloons Work? 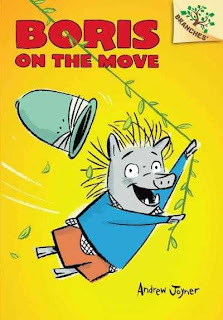 Roberta at Wrapped in Foil is back with Everybody Moves, a book to inspire kids to get up and move! 900s: History, Geography, Culture: It happened when? It happened where? What happened? I'm continuing in my new weeding plan. Now that I've done comprehensive weeding of every area, I'm doing sustainable weeding - a few small sections at a time. I have an excel spreadsheet breaking each area down so once I complete an area I'll cycle back and start again. With the nonfiction especially, I'm weeding and replacing as I come across gaps and I just discovered we have only one outdated book on rabbits, squirrels, and chipmunks. That's one book total! I added chipmunk books easily enough, but now I'm looking for books on squirrels and wild rabbits. This is also a sign of how unbiased I am, since I am waging an eternal war with the squirrels and am much more interested in figuring out how to get rid of them than buying books about them. Gah. So, the first title is part of the Backyard Wildlife series and is an easy reader. I looked at this series several years ago and bought a couple, but they're really too simple for what I want, plus an easy reader would end up in the easy readers and not in the nonfiction. Cross this one off the list. Next, we have a series called Backyard Safari. 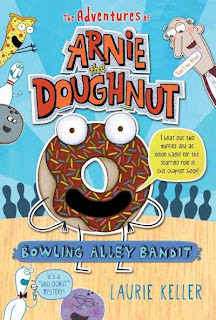 This is written by an author who's done a lot of Scholastic's True Books and it has a nice mixture of photos and text. However, it's more of an activity guide. 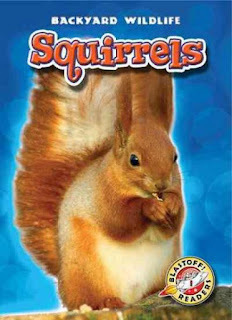 It has kids collecting equipment and going on a "safari" to watch squirrels. I will merely say that no such extensive preparations are needed in this area - just come over to my house and I can provide you with 2-10 squirrels at any time and in any weather. 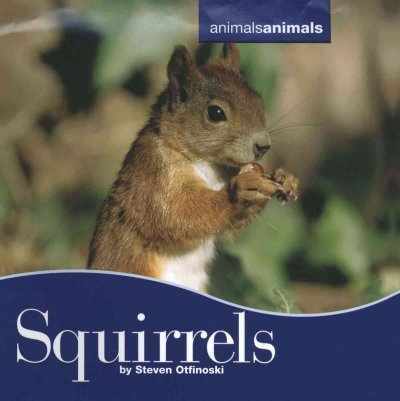 I really want something that's just basic information about squirrels. Also, the background color of all the pages is yellow which strikes me as very odd. The third book is from a series simply called Animals Animals and is the most text-heavy of the titles. It covers squirrels' life cycle, habitats, different species, and problems cohabiting with humans. There's no really solid solution given (not surprising, considering that nobody has ever really figured out how to deal with squirrels) but the author finishes by saying that most people like to watch squirrels and backyards would be very boring without them. Which I will admit is true enough. 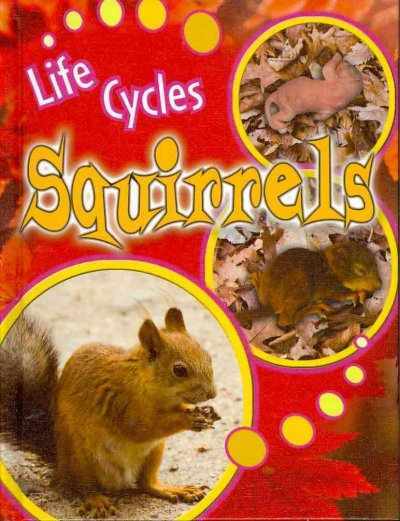 The final title is in the Life Cycles series and is a very basic introduction to squirrels and their life cycle from birth, growing up, mating, and birth again. There's information on their habits and habitats and lots of photos and extra facts. Verdict: I think the Backyard Wildlife series is far too expensive for the amount of text included and the National Geographic easy readers are far superior. The Backyard Safari series is interesting, but it is more focused on activities than information and it feels like a lot of work when you can just look out the window and see squirrels. 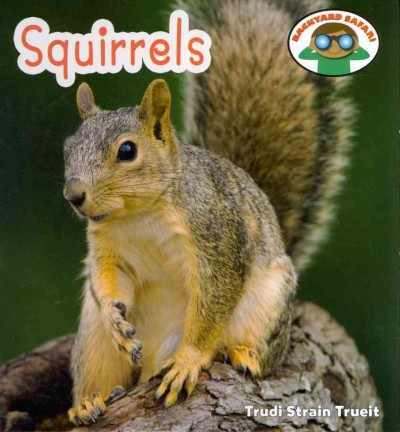 The Animals Animals series has the most information and would be the best title for kids doing research and the Life Cycles series will be most quickly picked up by kids who just want to learn more about squirrels. I'll be purchasing the last two titles. Tuesday - visit to Tibbets Elementary School. Some years I don't get to see all the kids here b/c of scheduling, but this year I saw them all. Even better, I was already "known" b/c I've been secretly visiting a kindergarten class here all year. Next year I'll be visiting all the kindergarten kids. And it didn't rain! (much). Doing school visits in the rain is Not Fun. Some of the most asked for books included the Even More Super-Sized series from Bearport, Unusual Animals, Ninja Meerkats, Frogged, and One Tough Chick. Wednesday was another hectic day with marketing meetings, the arrival of ducklings (we gave up on actually hatching the eggs) and yet another visit from our friends the police. Then I went home and thought about all the things I could have said to the kids but didn't b/c while I was dealing with them and calling the police I was also on the information desk, the phone was ringing off the hook, our director was in a meeting (which is why she just said "no swearing!" when she heard them say "f***ing c***t") and a long line of patrons annoyed over one thing or another was trailing through the library, plus the ongoing saga of the stolen library card. Thursday - visit to Jackson Elementary School. I only see kindergarten through 4th grade here, because starting last year the 5th graders come to the library! Generally enthusiastic group - this is the closest school to the library so almost all the kids have been here. Favorite books included the Even More Super-Sized series from Bearport, Stick Dog, Loki's Wolves, Zombie Makers, and Dance Class. After the visit I went back to the library to do a couple hours on the desk, found out a preschool class had showed up in my absence (worked out ok, b/c they mainly wanted to see the ducks and Pattie happened to be there) and went off around 2 to do errands, home to eat something, and back around 5 when I worked on my series project and some other stuff for about an hour. Then at 6 I went to a concert with Jim Gill organized by Pattie and various other school organizations at the middle school. I set up a table, poster, etc. and encouraged people to sign up for 1,000 Books Before Kindergarten and take information on summer reading. The concert ended rather hurriedly when severe storms started heading our way and I raced the storm home! Friday - the fame of our ducks has spread far and wide. A preschool class from the School for the Deaf in a neighboring town came over on a field trip. Pattie dropped by to show off the ducks and I read them Make Way for Ducklings while their teacher interpreted. Then they hung out in the children's area and enjoyed the library for a while. I did some desk time, finished repacking my crates for the middle school visit on Monday and Friday was OVER.